Dead Rat on Glueboard - Do Glue Boards Catch Rodents? 06.12.2005 - I arrived at a school in order to investigate a bad smell in one of the classrooms. The school had abandoned use of the room for a couple of days due to the odor, and finally decided to call me out to find and remove the source of the smell. Most dead animal jobs take me either five minutes or two hours. That is, the animal is either dead in some obvious and easy to access location, or it has died in some impossible to find and impossible to reach area. This was a five-minute job. I opened the drop ceiling panels, and voila, I found a dead rat stuck to a glue board. The school had hired a generic pest control company to perform rat extermination. They did a lousy job. Their solution was to set glue traps. While trapping is only one part of rat control (finding and sealing shut the entry points into the building is the most important step), it's still important to use the correct traps. I do not like glue boards, and have never used them for rat control. The capture rate is low, rats can often pull themselves free, and they are also comparatively inhumane. 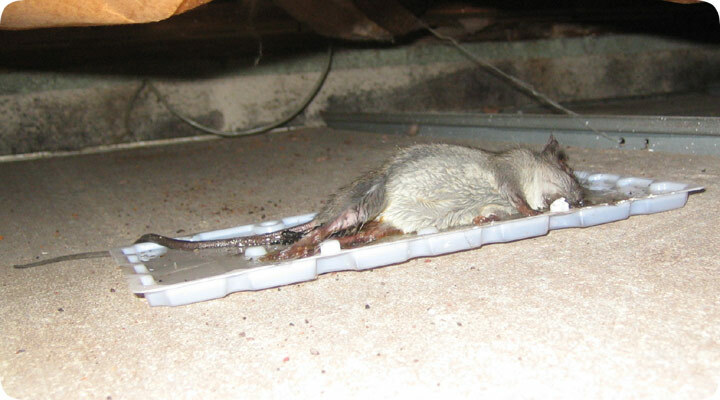 Whereas a snap trap quickly kills the rat, the animal must slowly suffer and die of starvation on the glue board. Another mistake that the pest control company made was in not checking their traps! They set this one a long time ago, and by chance happened to catch one (proof that the schools rat problem was never actually solved) and now the school got the odor. I removed the rat with the glue board and offered to provide a complete and permanent solution, but the school declined. Maybe they'll learn their lesson when they get another stink in one of the classrooms. Anyway, as was the case when I was a lad, I was glad to leave a stinky old school and get back out in the fresh air. And folks, please don't use glueboards for rodent control. That's my lesson for the day.